I will never understand this, so I am asking today. Do you have mix match socks in your house? I think I know how it happens, but why is it that I can't ever find the other sock to match ever again? I mean, did the machine eat the other match to the socks? I am speechless when it comes to this. Do you have any ideas? 1) Do you have mix match socks in your house? 2) why is it that I can't ever find the other sock to match ever again? Before you link-up, 1) make sure you read the Thursday Two Questions Details Page, 2) you have a link back to Thursday Two Questions, 3) and that you post your own Two Questions, or theme related. Links are monitored,&spam will be removed. Thanks for joining us today. 1) Haha..I gave up on trying to solve this mystery..I have heard that it's washing machine ghost that ate one of the pair. 2) I have many mix match socks in my house, and use them for dusting! I have so many socks without matches. In college, I would take a diaper pin and pin the matches together before putting them into the washer. We all have sock gremlins taking our socks! I always have that problem and I can never find the matches. hee-hee i seldom wear socks and i'm pretty organized with my socks [and underwear, the rest of my wardrobe is chaos], so i don't have this problem. i guess it's the universe telling you that you need to go sock shopping. 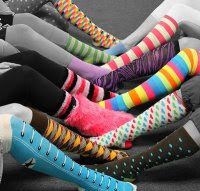 :p but mix-match socks seem to be in fashion very now and then. Oh yes, I use the ones that are left for dusting and cleaning. There is an "urban legend" that tells of a huge warehouse in Yakima, WA. All of the odd socks are stored there never to be seen again. The legend doesn't say how the odd socks get there. LOL! 1.If my husband was left to his own devices we'd have loads of those. 2. I've heard it said that some houses have a sock-monster on the prowl....Our boxer dog, sometimes takes on that role! Loving this link up, Amanda. Great idea! 1. Buy a whole bunch of the same type of socks, so that you can always match them. 2. For my kids, buy cute un-matched socks in the same color scheme or that coordinate in another way. Their grandma bought some of the "Little Miss-Matched" ones for them (they have boys socks too) which I love...and I got a bunch of different colored Sesame Street character socks for my youngest at Target's dollar section. Those can be mixed and matched...it's kinda cute to have Elmo on one foot and Big Bird on another. And my mom bought all of us some crazy knit socks for winter that are in the same colors but mismatched...those are cool too. I don't really have missing socks..coz I normally bundle them up during drying and they are put into pairs before placing in the drawer. Even if there is the odd sock..the other one normally turns up in the next wash cycle. I've not buy mismatched socks, but I might just do that. Or get all in white and be done with it. Just wear them mismatched and have fun just like the kids do!